“The desert is an ocean in which no oar is dipped,” the eponymous character in David Lean’s “Lawrence of Arabia” observed. And while it is no Sahara Desert, Vietnam’s “White Lake” is indeed an ocean; one with waves of gold and white sand that make it a must-see for anyone visiting this Southeast Asian nation. Mui Ne’s entire 15-kilometer beachfront is lined with hotels and guesthouses. Hotels can run into the hundreds of dollars per night, but it’s still possible to find guesthouses for about $15 per night. 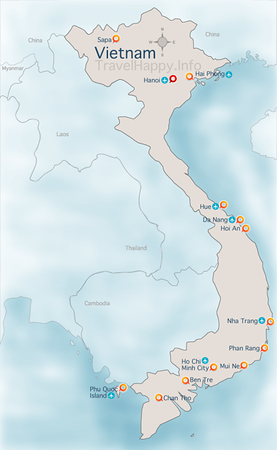 If you look at the map of the general area (known as Phan Thiet) you’ll see how stacked together Mui Ne’s hotels are. Tours usually are run in jeeps with four people, but are available as solo tours on motorbikes. With the distance and heat, the jeep is the better option. Prices for the shared jeep tour run as low at $7 per person while the motorbike tour will be about $35. If you don’t get the price you want, walk out. There are lots of agents. Tours run twice a day, at sunrise and sunset. The morning tour, which departs around 4:30 a.m., is far preferable, as you won’t arrive at your first destination in the heat of the day. Doing the sunrise tour will have you arrive just as the sun peeks over the horizon. Have your camera ready. It’s hard to appreciate the size of the dunes until you actually scale them. Standing atop one, I pointed out a tall dune to a fellow traveler, who remarked it wasn’t really that big or far. “Do you see that tiny black dot at the top there?” I replied? Until the turn of the century, Mui Ne could only be reached by boat. Walking across the sea of dunes, which span kilometers and are growing each year, was simply too dangerous. Mui Ne gets less rain – about 50 cm. per year – than any place in Southeast Asia. So, yeah, they’re hugely impressive. But what do you do when you go there? Take pictures, obviously. Hike up and down the hills and pose for pictures. Or, as some Vietnamese couples do, surprise the daylights out of tourists by showing up for wedding photos in a full wedding gown and tuxedo. Outside of photography, the most-popular diversion is to give one of the dozens of kids scrumming around a few thousand dong and rent a plastic sheet … for sledding! In Vietnam, there is no snow. So you sledding means dunes. Climb to the top of a really big dune, slide down and hopefully end up without sand down your throat. You could also give up a lot more dong – a U.S. $20 bill – and rent an ATV. For 30 minutes. Most think it’s a complete ripoff and won’t indulge the punks running the sole ATV rental booth under the shade trees, but there will always be someone who doesn’t care. You can also stroll around the area’s three lakes: Bau Ong (Gentleman Lake), Bau Ba (Lady Lake) and Bau Xoai (Mango Lake). Even Bau Ba is being affected by the sand, it’s 14.5 meter slowing filling up and, one day, depriving the area’s residents of their main water source. Time flies extremely quickly and after realizing you’ve been playing Lawrence of Arabia for about two hours, you’ll head off to the red dunes. 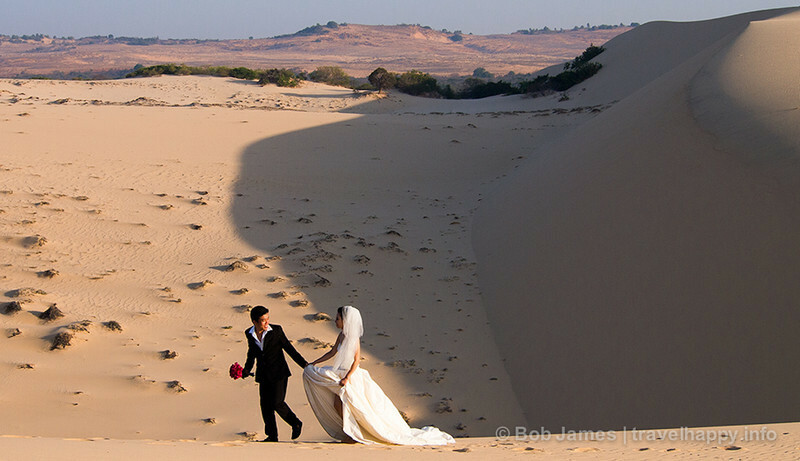 Same concept, only with smaller, (obviously red-sand) dunes, more tourists and less awe. 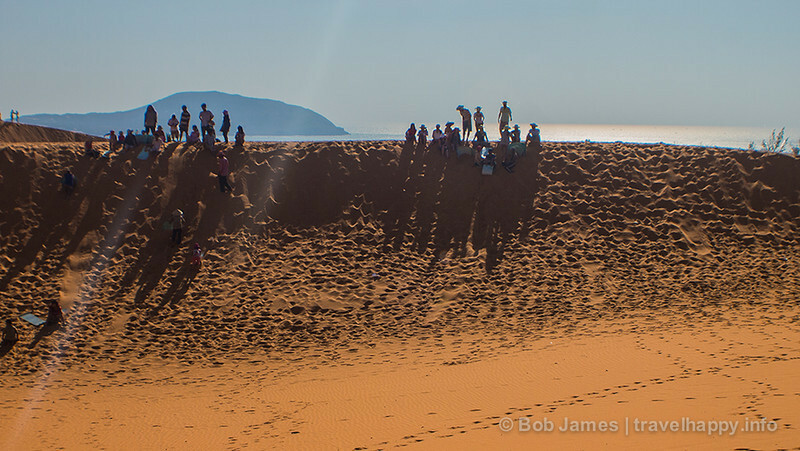 Basically, the red dunes are “OK.” You can sled here, too, as the busloads of Viet and Chinese tourists do, but perhaps the most notable feature of the red dunes is that they are located on the coast. It makes for a unique backdrop for photos, although the sun at this point will 45 degrees in the sky above the water and nearby island, making photography tricky. If you’re like me, you’ll have spent most of your time climbing dunes, leaving you too little time at the next stop – the “fairy stream” – to actually reach the waterfall at the mouth of the wannabe river. Reports from those trekking back from it, however, say you won’t miss much. Spend a few minutes next at the Ham Nin taking photos and then head back to the beach. The white sand dunes alone are worth the price of admission. Consider the last few stops free bonuses.